CNN ends 2014 firmly ahead of MSNBC for the year while posting its best competitive position in Primetime since 2008. This year is the first time since 2011 that CNN ranks #2 in Total Day among both total viewers and the demo 25-54. CNN has outperformed MSNBC in primetime and total day for five straight months, the longest winning streak over MSNBC in six years. CNN’s signature news programming including New Day, Outfront with Erin Burnett, AC 360, D.C.-based and Sunday morning programming all easily topped MNSBC this year in the key demo 25-54 rating. For the year, CNN dayside beat MSNBC during that day part by an impressive +73% in total viewers and +83% in the demo 25-54 rating. CNN Original Series programming delivered a winning ratings performance as well, dominating their respective time slots this year. Total Day (6a-6a): CNN tops MSNBC for the first time since 2011 among both total viewers and the demo 25-54 rating: CNN 402k vs. MSNBC’s 350k total viewers / CNN 127k vs. MSNBC’s 110k demo 25-54. M-Su Primetime and M-F Primetime (8-11pm): CNN tops MSNBC in the demo 25-54 for the first time since 2008: M-Su primetime CNN 187k vs. MSNBC’s 174k and M-F primetime CNN 194k vs. MSNBC’s 175k. Dayside (9a-4p) CNN tops MSNBC by +73% in both total viewers (462k vs. MSNBC’s 267k) and by +83% demo 25-54 rating (121k vs. MSNBC’s 66k). In M-Su Primetime, CNN posted its youngest median age (58 years) on record, tying with the 2008 presidential election. Meanwhile MSNBC (61 years) and Fox News (68 years; tying with 2013) are at their oldest levels on record in primetime. In Total Day, Fox News is pacing at its lowest yearly P25-54 delivery since 2001, and lowest yearly P2+ delivery since 2008. In both M-Su Prime and M-F Prime, Fox News is tracking at its 2nd lowest yearly P25-54 delivery since 2001 (after 2013), and 2nd lowest yearly P2+ delivery since 2007 (after 2013). In Total Day, MSNBC is pacing at its lowest yearly P25-54 delivery since 2005, and lowest yearly P2+ delivery since 2007. In both M-Su Prime and M-F Prime, MSNBC is tracking at its lowest yearly P25-54 delivery since 2006, and lowest yearly P2+ delivery since 2007. New Day and HLN beat MSNBC’s Morning Joe in the demo in 2014 (104k vs. 100k), with Joe falling to 4th. This is CNN’s best finish in the 6-9am time period since 2008 and HLN’s best since 2011. CNN’s New Day is also the only cable morning news program to grow this year in total viewers, increasing +8%, while Fox and Friends is down -7% and Morning Joe declined -15%. New Day has outperformed MSNBC for six straight months in the demo 25-54 this year, its longest winning streak since the program’s debut in June 2013. All of CNN’s dayside programming (9a-4p) easily topped MSNBC this year in both total viewers (462k vs. 267k) and by almost double in the demo 25-54 rating (121k vs. 66k). The Lead with Jake Tapper ended the year ranked #2, topping MSNBC in both total viewers (491k vs. 359k) and in the demo (125k vs. 71k). From 5-7p, The Situation Room with Wolf Blitzer also ranked #2 in adults 25-54 (155k vs. 117k). Erin Burnett Outfront topped MSNBC’s Hardball for the year in the demo (163k vs. 159k). Outfront outpaced Hardball for eight of the past 12 months, and has had a consecutive winning streak for the past six months. This year represents the first time since 2009 that CNN programming at 7pm ranked #2 in the key demo 25-54. EBOF is the only cable news network to grow in its time period, increasing +3% in the demo vs. a year ago, while Fox News is down -5% and MSNBC is off -12%. AC 360 (8pm) has a strong lead over MSNBC’s All in with Chris Hayes, ahead by +24% this year. In 2014, AC 360 ranked #2 for the second consecutive year in the key demo (190k vs. MNSBC’s 153k). CNN programming at 9pm posted the largest and only double digit-increase in the demo this year, up +14%, Fox News +6% and The Rachel Maddow Show is down -19% vs. a year ago. Maddow, which debuted in late 2008, is registering its lowest yearly 25-54 and total viewer levels on record. CNN programming at 10pm (mostly CNN Tonight) also ranked #2 this year, topping MSNBC (182k vs. 160k) in the demo 25-54. Fareed Zakaria GPS ranked #2 in both total viewers and the key demo at 10am and 1pm. GPS grew by +13% in total viewers at 10am vs. a year ago. Reliable Sources with Brian Stelter ranked #2 in total viewers and among 25-54 at 11am. RS increased +4% in total viewers this year. A new audience, reaching over nine million new P2+ viewers in 2Q-14 alone. A younger audience, driving down CNN’s median age among all prime programming to 58 years, tied with the 2008 Presidential election year for its youngest on record. A more upscale audience, and more time-shifted viewing. Overall, CNN Original Series were up double-digit percentages from Live to Live+7/Most Current viewing among both P25-54 (+52%; 291k vs. 191k) and P2+ (+37%; 728k vs. 531k). Source: The Nielsen Company, 12/30/13-12/22/14. Data based on blend of most current Live+7 data streams. Somebody’s Gotta Do It with Mike Rowe Season 1 (10/8-12/22/14): Over its eight 9p premieres, averaged 296k P25-54 and 686k P2+. Ranked #2 in P25-54 across cable news in its time period, more than doubling MSNBC’s Rachel Maddow Show (+116%; 137k). Anthony Bourdain: Parts Unknown Season 4 (9/28-11/16/14): Over its eight Sunday 9p premieres, averaged 362k P25-54 and 715k P2+. Ranked #1 in P25-54 across cable news in its time period, outperforming the combined delivery of MSNBC (128k) and FXNC (122k). Every premiere episode of Parts Unknown in Season 4 also ranked #1 in P25-54 across cable news in its time period. This is Life with Lisa Ling Season 1 (9/28-11/16/14): Over its eight Sunday 10p premieres, averaged 273k P25-54 and 607k P2+. Ranked #1 across cable news in its time period among both demos, beating MSNBC (171k) by +60% and more than doubling FXNC (+118%; 125k) in P25-54. The Hunt with John Walsh Season 1 (7/13-8/31/14): Over its eight Sunday 9p premieres, averaged 297k P25-54 and 871k P2+. Was the #1 program on CNN among both demos. Ranked #1 across cable news in its time period in both demos, outperforming the combined delivery of FXNC (158k) and MSNBC (131k) among P25-54. Every premiere episode of The Hunt also ranked #1 across cable news in its time period among P25-54. The Sixties (5/29-8/14/14): Over its 10 Thursday 9p premieres, averaged 298k P25-54 and 1,085k P2+. Ranked #2 across cable news in its time period among both demos, beating MSNBC by +91% in P25-54 (156k) and +39% in P2+ (783k). Anthony Bourdain: Parts Unknown Season 3 (4/13-6/8/14): Over its eight Sunday 9p premieres, averaged 402k P25-54 and 797k P2+. Was the #1 program across all of cable news among P25-54, ranking comfortably above the #2 program – FXNC’s The O’Reilly Factor (M-F 8p, 358k). Ranked #1 among cable news in its time period in both demos, outperforming the combined delivery of MSNBC (171k) and FXNC (113k) among P25-54. Morgan Spurlock: Inside Man Season 2 (4/13-6/8/14): Over its eight Sunday 10p premieres, averaged 228k P25-54 and 429k P2+. Ranked #2 in P25-54 across cable news in its time period, only -1k behind HLN (229k), outperforming MSNBC (206k) by +11% and FXNC (120k) by +90%. Chicagoland (3/6-4/24/14): Over its eight Thursday 10p premieres, averaged 241k P25-54 and 586k P2+. Ranked #2 in P25-54 across cable news in its time period, ahead of MSNBC (170k) by +42%. Death Row Stories Season 1 (3/9-9/7/14): Over its eight Sunday premieres, averaged 217k P25-54 and 625k P2+. Ranked #1 in P25-54 across cable news in its time period, beating MSNBC (157k) by +38% and FXNC (142k) by +53%. Source: The Nielsen Company, Live+7 (thru 12/14/14) blended with Live+3 (12/15/14-12/22/14) data. CNN posted gains with CNN Films this year. CNN Films had solid DVR playback, with the most recent offering of Dinosaur 13 seeing the largest growth versus Live viewing in both P25-54 (+52%) and P2+ (+29%) this year. From Live to Live+7 viewing, Dinosaur 13 (+52%), Whitey (+22%), Ivory Tower (+15%) and Documented (+8%) saw the biggest increase across cable news in their respective time period among P25-54. Of the 15 CNN Films premieres to-date (3/10/13-12/11/14) Dinosaur 13 was the 3rd-highest rated in P25-54 (after Blackfish (10/24/13) and Sole Survivor (1/9/14) and the 2nd-highest rated in P2+ (after Blackfish). 41 on 41 ranked #1 in P25-54 (176k) across cable news in its time period, outperforming MSNBC (144k) by +22% and FXNC (93k) by +89%. Lady Valor ranked #2 in P25-54 (161k) across cable news in its time period, beating MSNBC (114k) by +41%. Source: The Nielsen Company, 3/10/13-12/11/14. Live+7 data. 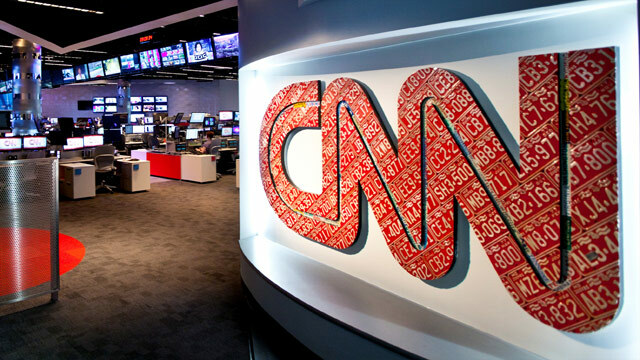 In 2014, CNN posted an average monthly reach of 77 million, the most of any cable news network. Fox News followed with 67 million and MSNBC trailed with 64 million. Data is a blend of Nielsen Live+SD and the more inclusive Live+3 and final Live+7 data when available. Data is run from 12/30/13-12/26/14 and not does not include the last two days of the year, 12/27 & 12/28. CNN did not have carriage on DISH for most of the month of November (about 14% of distribution).